A deep central graben in this area is considered to be an oil and gas "source kitchen" and potential hydrocarbon trapping prospects have been identified adjacent to this area. The Kifaru Prospect and Kifaru West Prospects are interpreted to be large stacked Miocene reefs, with interpreted good lateral and top seals and close proximity to mature Eocene source rocks. The Tembo Prospect is a large tilted fault block trap, with interpreted sandstone reservoirs at a number of levels. Block L6 covers 5,010 sq km with about one quarter onshore and the remaining offshore to 400 metres water depth. The Block lies in the Lamu Basin and within the Tana River delta, north of recent world-scale natural gas discoveries off the coasts of Mozambique and Tanzania. Following encouraging hydrocarbon generation and migration studies, the joint venture is exploring the offshore portion of the licence area. A deep central graben in this area is considered to be an oil and gas “source kitchen” and potential hydrocarbon trapping prospects have been identified immediately adjacent to this area. The largest prospect is the Kifaru Prospect in water depths of 80m to 100m in the southwest of the L6 area. This prospect and several others have been covered by a 3D seismic survey. Pancontinental’s joint venture partners in the L6 Block include FAR Limited (ASX:FAR) (Operator) and Milio International Group. 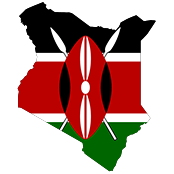 The Kifaru 3D seismic survey acquisition was completed in offshore Kenya during July 2012. The survey covered 778 sq km over several prospects, including the primary Kifaru Prospect, in a southern portion of the L6 area. 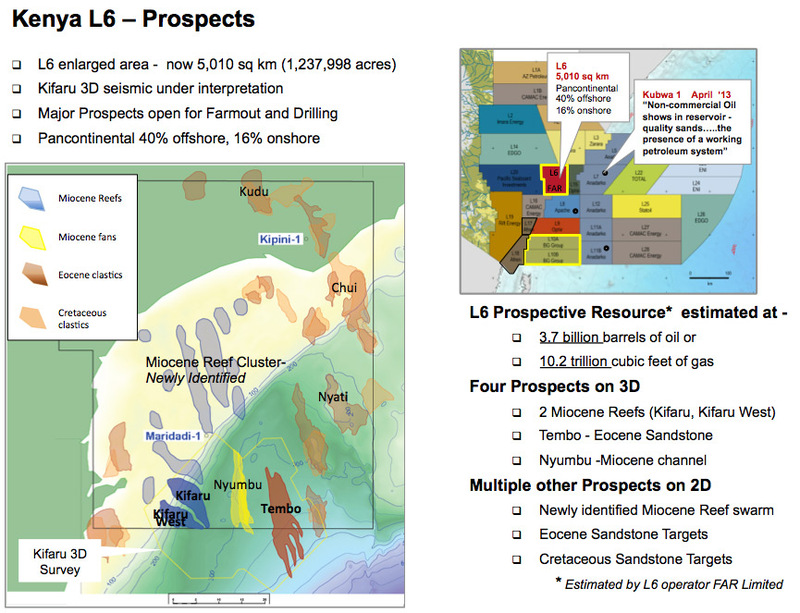 According to an assessment by operator FAR Limited, the L6 area has potential to contain approximately 3.7 billion barrels of oil or 10.2 trillion cubic feet of gas prospective resources on a gross, un-risked, best estimate basis. The three prospects covered by new 3D seismic (Kifaru, Kifaru West and Tembo) have combined potential for approximately 630 million barrels of oil on an un-risked, best estimate, undivided 100% basis. Based on the new 3D data three prospects have been mapped, Tembo, Kifaru and Kirfaru West, with prospective oil equivalent resources of 327, 178 and 130 million barrels respectively (un-risked best estimate, 100% basis). In a gas-only case the respective volumes are 807, 517 and 388 billion cubic feet. The chance of a gas discovery have been assessed at 21%, 19% and 18% respectively. The Kifaru Prospect and Kifaru West Prospects are interpreted to be large stacked Miocene reefs, with interpreted good lateral and top seals and close proximity to mature Eocene source rocks. Tembo is a large tilted fault block trap, with interpreted sandstone reservoirs at a number of levels. A number of oil and gas play types and prospects have been mapped and on this basis the location of the first exploration well will be selected. Following the reinstatement of a previously relinquished area, re-examination of 2D seismic data has revealed a cluster of interpreted Miocene reefs that will be subject to further mapping. These reefs are on trend and north of the Kifaru Prospect. The Kudu Prospect, being onshore, is located where a smaller gas or oil discovery could be readily commercialised. 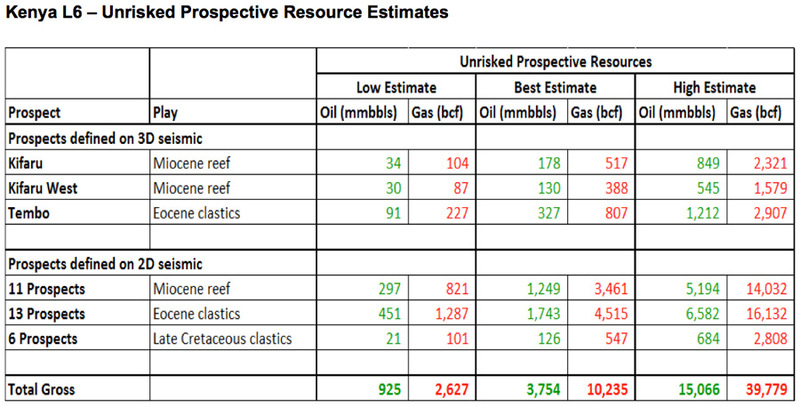 The Kifaru Prospect, a Miocene reef accumulation, has been assessed by L6 Operator FAR Limited to have potential to contain approximately 178 Million Barrels of recoverable oil (Best Estimate Unrisked Prospective Resource). 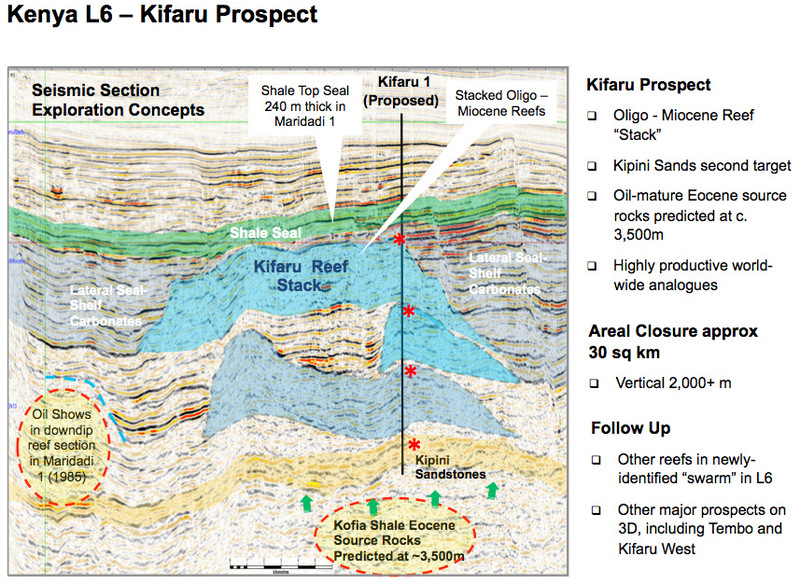 The similar Kifaru West Prospect has potential for 130 million barrels. A number of other possible Miocene Reefs have been identified to the north of the Kifaru area. The location, timing, depth and stratigraphy of a potential well will be determined after final interpretation of the 3D seismic data and consultation with joint venture partners. 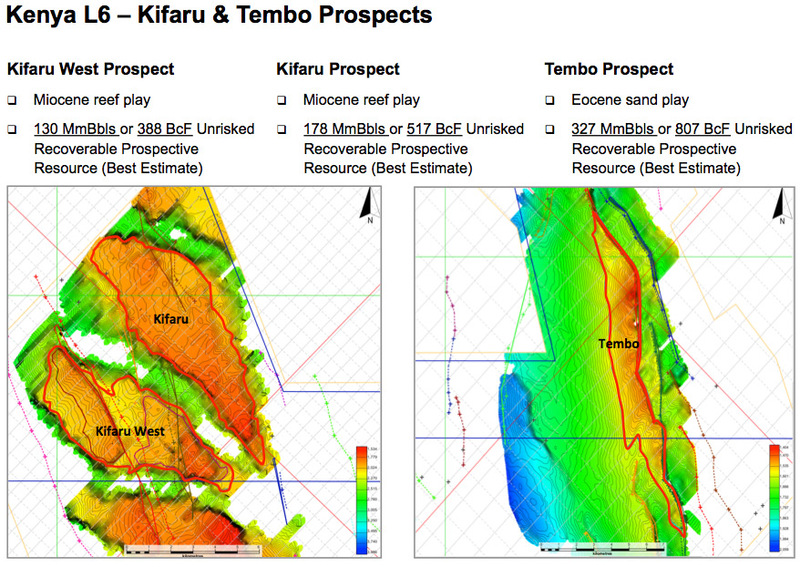 The Kifaru and Tembo Prospects are the main targets of interest, with Kifaru drilling the most likely outcome.